We Are Now Post-Disruption. We Are Now Creative Innovation. Similar to telescopes snapping pictures of supernovas that took place eons ago, media outlets such as Fast Company are spectacularly identifying “disruptions” as if they are in the immediate present. From my perspective, where I assist companies seeking to shift their communications functions, many of these disruptions are now in the past. We’ve moved past the peak of our disruptive era. We are now in a “pause” in time where we can see an the effects of disruption clearly and ruminate on their cause and effects. (For more about identifying “pauses” please check this earlier post on the Trend Pendulum). At the same time, we are now entering a new era. Many companies will still be disrupted. Staid businesses, such as food giant ConAgra and publishing giant BMG, have not yet made shifts to protect their firms from the eventual disruption of creative destruction (look at what happened to Hostess). Both of these giants have found temporary solace through consolidation. Other giants of industry, such as GE and IBM have found a positive way forward, moving past staidness and into agility. In tandem there is a wave of both new businesses and innovative-minded businesses that are either being built or rebuilt to thrive within our new business era. Our new era is anchored to the business realization that change occurs more frequently than ever before. The successful path in the new era is to elevate the role of agility as a foundational part of a business model. This is not theory, this is happening now, live. Still, there are plenty of staid businesses that are holding firm, seeking forward paths through more of the “same old, same old.” Therefore, there is plenty of work to be had for change agents to assist these businesses either when they have come to the necessary fork in the road, or when they are under unfortunate distress. At the same time, there is a new area of work to be found and a new importance for the position of innovation and creative professionals. At the highest level, there is now a need for a Chief Innovation Officer and a Chief Creative Officer. Companies should at least be hiring for executive level Innovation and Creative professionals (or engaging with agencies who can provide these services) to audit, assess, build and re-build the incremental plans to ensure companies are compliant and thriving within our new post-disruption era. Instead of a focus and fearful stalling on Creative Destruction, it’s time to shift our focus and energies to Creative Reconstruction! Disruption will still occur, and will do so for the next decade or so, but now there is a clear way forward for companies who want success for the next 100 years. We’ve exited the Disruption era. We’re now entering a new renaissance, a new era of productivity. We’re in an era of creative innovation. 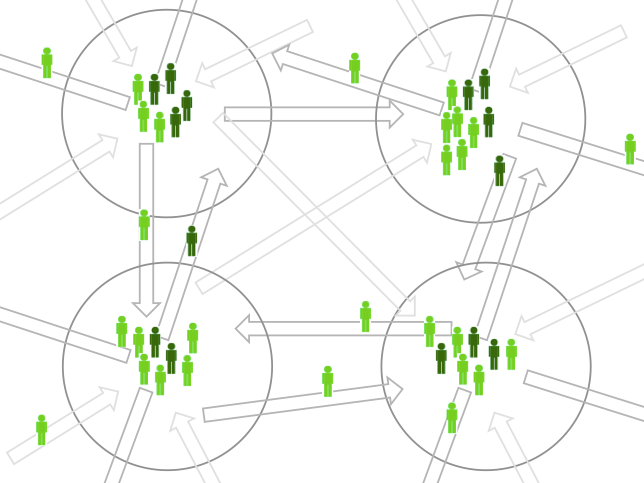 An adaptive business model that shifts organizations incrementally versus painful disruption. To be competitive within our current and future business environments, organizations need to build internal team models that succeed by “going with the flow.” This is not a passive act, it’s the building of a system that harnesses the power of disruption and innovation. 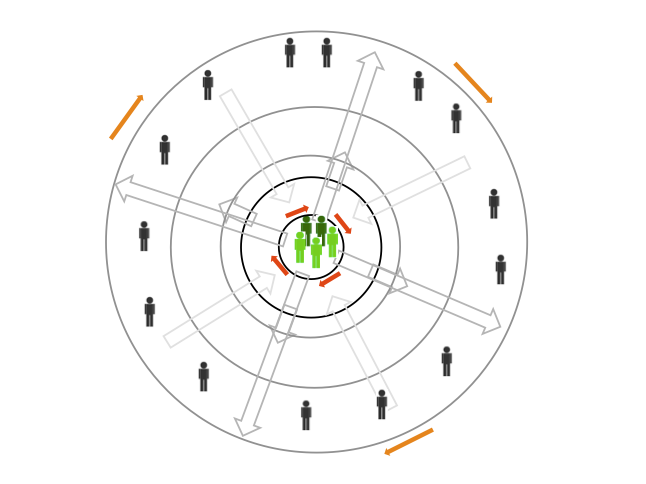 Disruption is a continuum; this model creates a method to mitigate disruption by working within it. 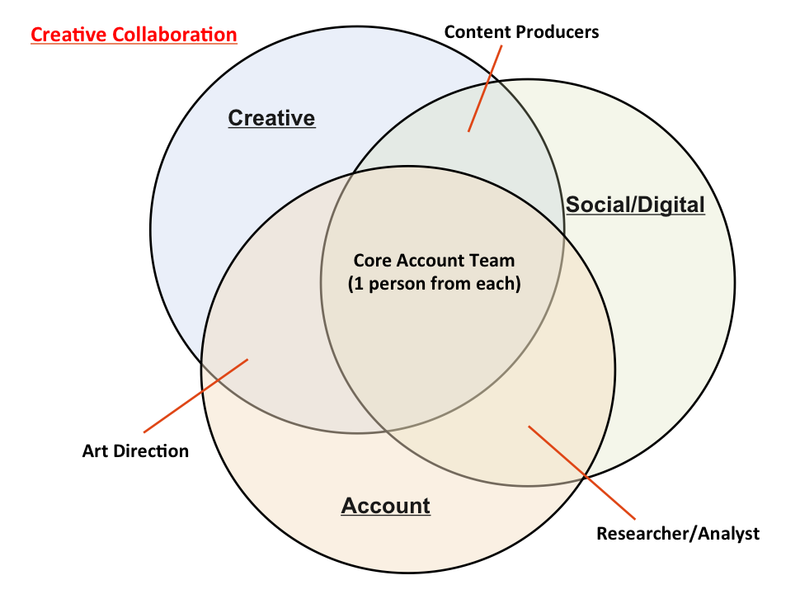 I drafted and implemented this model during my two years working on social and digital programs at the PR agency, Waggener Edstrom. 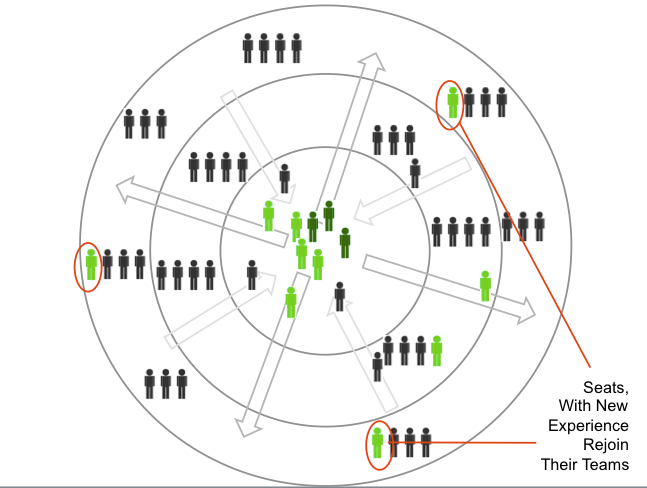 This idea is not original; it’s a modification to existing models on team management. Plus, this model couldn’t be accomplished without the input of the clients I assisted at the time. This model was successful for my team in our pursuit of assisting current clients, attracting new clients, and transforming the all-up agency to become more facile in bringing our clients into new opportunities. The best metaphor for this model is a gyroscope. 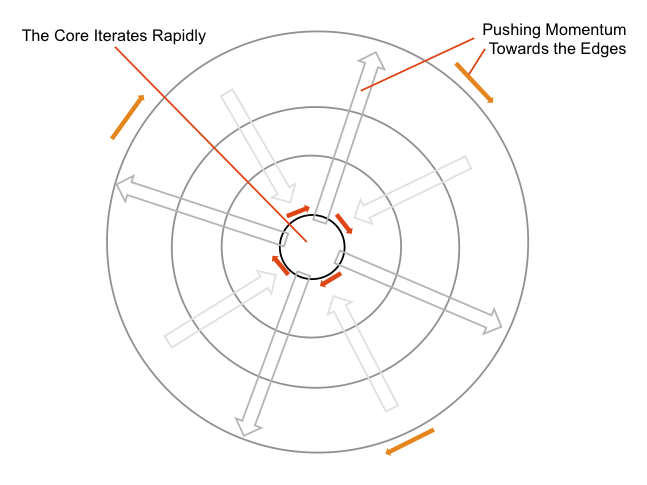 The core team “spins,” producing iterative and creative work that then moves the entire organization in the direction of momentum. The core team produces deliverables, for clients and the organization that incrementally educates all stakeholders on new learnings. 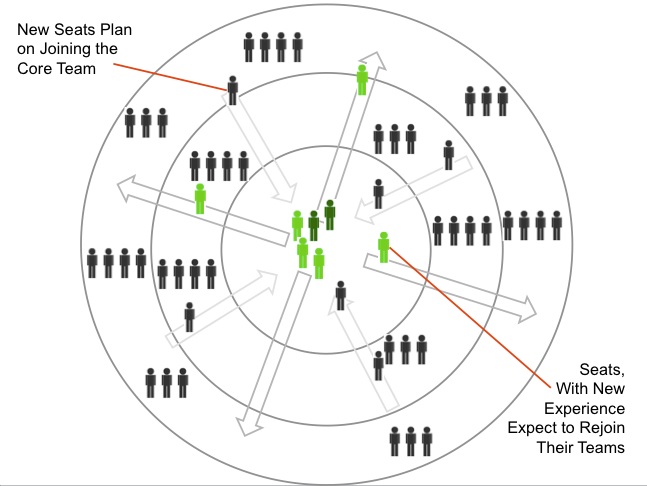 “Leads” are identified from across the organization to manage a project, team or initiative. As example, At Waggener, our initiative was to increase the social media offerings for clients. Leads with Social Media experience were identified to lead the team. 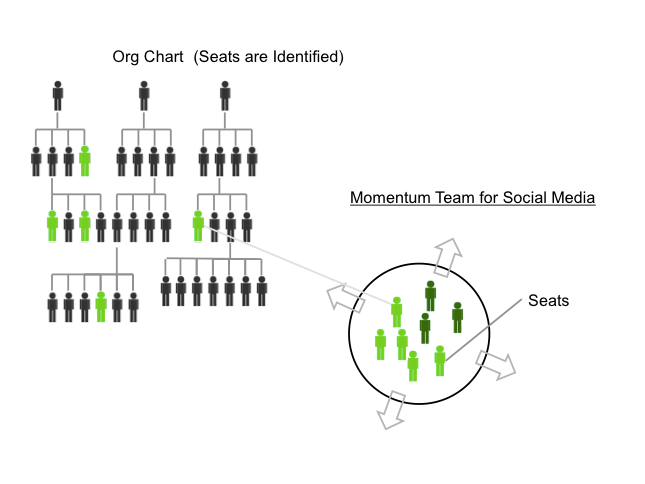 “Seats,” the people who make up the team, are then identified from across the entire organization. 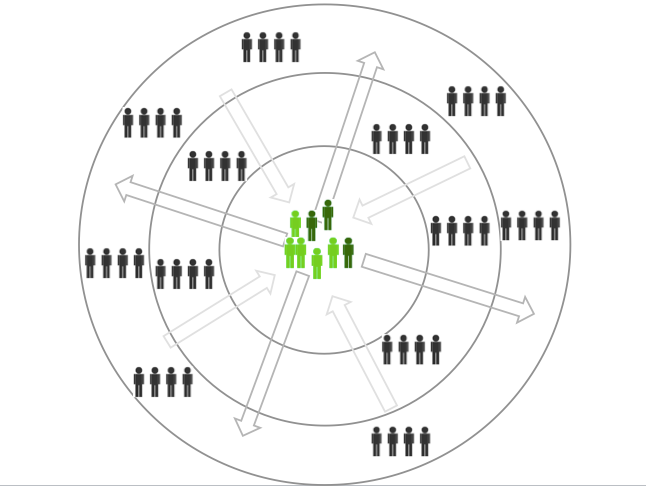 Once tenure on a core team is completed, the Seat is then assigned to a new team and/or returns to their previous position (such as back on the sales team). Leads will remain with the core team as long as that function is needed. In some cases the Leads will go on to lead other core teams or take new positions within the organization. 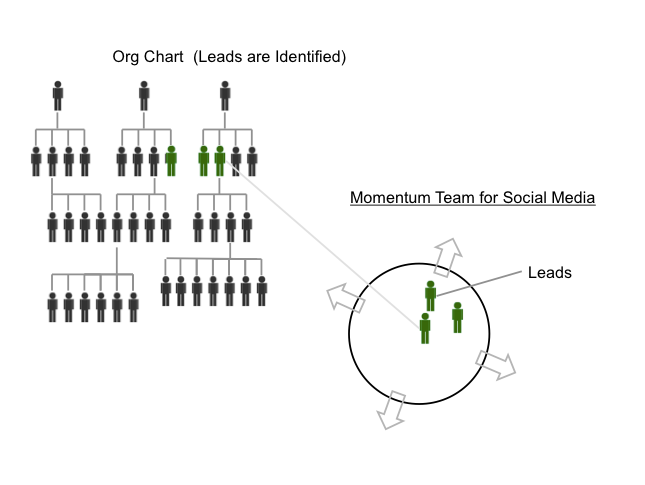 As example, at Waggener, the Leads were semi-permanent as bringing social to the organization was a long-term process. Our approach was to rotate the core team lead at least once per year. This way the Leads remained on the core team, but each had an expected time when they would set the agenda for the team. In the ideal situation, over time, the entire organization will adopt this agile team model, becoming an organization build of agile teams. Start-ups, such as Spotify, are built this way (http://techcrunch.com/2012/11/17/heres-how-spotify-scales-up-and-stays-agile-it-runs-squads-like-lean-startups/). Ultimately this creates better, higher-value work for clients & customers. And that’s the end-goal of any organization.